The Bureau of Labor Statistics (BLS) released new 2012 workplace fatalities data from its Census of Fatal Occupational Injuries on April 28, 2014. The fatality rate accross all occupations for 2012 was 3.4 deaths per 100,000 full time equivalent workers. This is slightly higher than the 3.2 number reported last August, but is still the lowest rate since 2006. Of the 4,628 worker deaths in 2012, the highest fatality rate was for the Agriculture, Forestry, Fishing and Hunting industry sector, at 22.8 deaths per 100,000 full time equivalent workers. 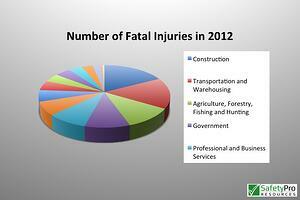 An area of concern is the construction industry, which saw an increase in the fatality rate in 2012. The fatality rate for the building industry across the board was 9.9 in 2012, up from 9.1 in 2011. Roofers had a death rate of 42.2, up from 34.1 in 2011. One possible reason for the increase in fatalities in the construction occupations is the increased demand for construction, which puts more workers on the job who may be inexperienced or lack proper safety training. In response to this higher rate of construction fatalities, OSHA has renewed its fall prevention education campaign and has scheduled a fall protection stand down on June 2-6, 2014. For a more detailed summary of the data, view the SlideShare presentation below.